We’re in Prairie du Chien, Wisconsin right now on our virtual drive through Crawford County in Southwestern Wisconsin from Rising Sun to Prairie du Chien following the Black River Road now known as Highway 27. 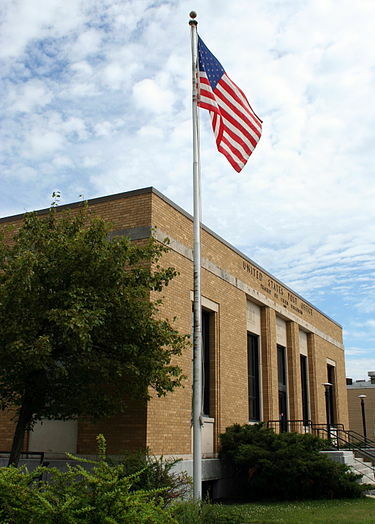 The Post Office in Prairie du Chien had a Postal Savings program in the 1940s and 1950s. Some people didn’t trust the banks. Besides John Dillinger and Bonnie and Clyde didn’t hold up post offices. They took your money and paid 2 percent interest. Once a year Dad would take Phillip, Bob, and me with our piggy banks and climb the many steps to the Post Office. Each of us had a little booklet with a record of deposits and withdrawals. Of course, all we had was a column of deposits. No need to withdraw any money. Our folks would not allow us to take money out. The whole idea was to establish a habit of savings. Start the kid saving money when they’re very young!Inside the impressive stone Post Office building we would troop. One by one, Phillip, Bob and I would take our little piggy bank to the teller who was standing behind steel bars. We handed him our bank and booklet. He would take the money and count it out. He then recorded the amount in the booklet and returned the Malta Dextrose can and booklet. I remember one time my savings for about a year was $3.39. But the biggest Post Office adventure was not depositing our money to the federal government. It was looking at the pictures of the criminals wanted for various crimes. Wanted posters were stapled on cork boards all along one wall. These were posters of really bad guys. Big headline on the top of one poster; “Wanted for Murder”. The poster would have his picture, and statistics about birth date, age, crimes committed, method of operation, and reward. These hombres were really bad dudes, they looked mean and rough, and they would rather shoot you dead as look at you. No one smiled in these pictures. We tried to fine the “baddest guy here”. They all had a number they were holding, five or six digits. All had a front photo and side photo. Bob found one person wanted for murder, weapons violations, interstate something or other and the man had been in three different prisons and escaped once or twice. We would have kept searching those wanted posters for hours if we were allowed. But Dad had us move on. No need for the Scheckel boys to be gawkers, you understand.